Profigold PROI3302 2m IPod audio cable, potable audio interconnect. 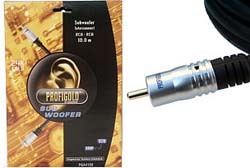 Profigold PROI3302 Ipod audio cable for portable audio and mp3 players. Slim-line 3.5mm connector, complies with Apple iPod, iPhone and iPad. Interference Absorption Technology to eliminate interference in the data transfer.